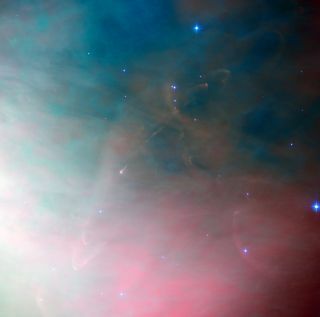 This image taken by the Hubble Space Telescope shows the spectacular region around an object known as Herbig-Haro 502, a very small part of the vast stellar nursery in the picturesque Orion Nebula. An infant star is visible just left of center. The Hubble Space Telescope has peeredinto a vast stellarnursery and snapped a photo of a newly born star. This leftover material may accrete toform planets andeventually solar systems as intricate as our own. A similar gaseouscloudlikely cocooned our own sun about five billion years ago, before Earthand ourneighboring planets formed. The narrow pink jet extending away tothe upper right of theyoung star is part of an object called Herbig-Haro 502. Herbig-Haroobjects are glowing gaseous areas close to recently formedstars. They arecreated when very young stars eject gas at breakneck speeds ? up tohundreds ofkilometers per second ? which heats the surrounding gas and causes itto glow. These ephemeral shockwaves arethought to dissipate after afew thousand years, the blink of an eye in the cosmic scheme of things.Herbig-Haro objects vary in size but are often much larger than our ownsolarsystem. The OrionNebula is one of the closest areas of star formation to us.Hubble hasspent a lot of time looking at Orion, as researchers have often usedthe spacetelescope to study how stars form and evolve. Images such as this canhelpastronomers understand more about how the universe developed and how itischanging, researchers have said. This image was taken with the HubbleSpace Telescope's Advanced Camera for Surveys. The picturewas created fromimages taken through filters that isolate the light from glowinghydrogen(colored red in the picture), ionized oxygen (green) and yellow light(blue).The exposure times were 1,000 seconds, 2,000 seconds and 1,000 seconds,respectively. The field of view is about 3.3arcminutes across as seen byHubble. The moon, in comparison, is about 30 arcminutes (half a degree)acrosswhen viewed from Earth. An arcminute is a unit of angular distance equal to a60th of a degree. The nearly 20-year-old Hubbleobservatory hasbeen snapping iconic photosof the universe since it was launched in April 1990. Over the years ithas beenvisited by astronauts multiple times for repairs and upgrades,including duringa space shuttle mission in May 2009. That trip left the telescope ingoodenough shape to keep running for at least five more years.